Thank you to everyone that came to support Plus One Foundation at the 2018 Mermaid Party! 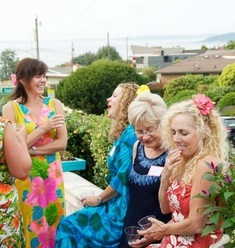 We enjoyed an evening of Hawaiian music, food, and drinks. A special thank you to all of the people that donated to this event! Also, thank you to STRUM: Seattle's Totally Relaxed Ukulele Musicians for providing Hawaiian music throughout the night! Thanks to everyone that came out to eat delectable Alaska seafood, delicious wine, good company, door prizes, and entertainment! All proceeds will benefit people with neurological conditions to have access to aquatic therapy. We had an evening listening to live Ukulele music provided by STRUM: Seattle's Totally Relaxed Ukulele Musicians! A big congratulations to all the winners of our wonderful prizes! We joined together for our annual Mermaid Fundraiser to help provide more people with access to aquatic therapy! We had a blast that came with delicious food, great wine, fantastic prizes, and our live Ukulele music entertainment from STRUM. It was truly a night to remember! Check out the event on Facebook to see more details and pictures. ﻿Please come show your support and join in on all the fun! And if you cannot join us, you can still make a difference today just click here! Another blast at this year's Mermaid Fundraiser! We had a fantastic night filled with amazing prizes, wonderful wine/food while raising hundreds of dollars to fund pool passes for adults and children with neurological disorders. To join the Mermaid Gill'd and help us plan future events, click here to be a volunteer. Check out our Facebook to see more photos! Another great year for the Mermaid Fundraiser! It was a wonderful night that included prizes, wine, and food! We raised hundreds of dollars to support our goal to fund pool passes for adults and children with neurological disorders! What an amazing Mary 'Mermaid' McKillop Fundraiser! We had fantastic prizes (click here to see the list!) and raised hundreds of dollars while supporting our goal to fund pool passes for adults and children with neurological disorders.